One of the things that we pride ourselves on here at the Porcupine’s Quill is our dedication to paying homage to the ways in which the arts intersect. Words, music and images work together to form new and interesting narratives that transcend genre. 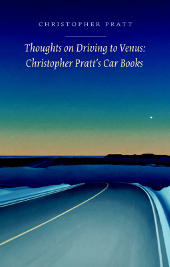 A perfect example of this is Christopher Pratt’s soon-to-be-launched Thoughts on Driving to Venus, a sort of memoir/journal/diary that Pratt likes to call his “car books”. In it, sparse, poetic prose teems with imagery that practically begs to be painted. Thoughts on Driving to Venus documents the thoughts, memories and impressions of the iconic Canadian painter Christopher Pratt as he drives across Newfoundland in search of inspiration for his art. It covers car trips taken by Pratt and his wife Jeanette from the late 90s through to 2014. What makes this book so unique is the way in which is goes beyond simply recording an accounting of days of driving in search of inspiration, but also offering insight into the way that the iconic Canadian painter sees and experiences the world. Many of his short, pithy entries are like paintings themselves, full of impressions of light and colour and telling similies. The book also contains a brilliant introduction by author, curator and all-around art guru Tom Smart, that talks about Pratt’s artistic works and some of the ways in which we can interpret the car books in light of them. Tuesday, August 3. Annieopsquotch Mountains: old wrinkled hills, grey like the carbuncled hides of elephants. Moss-stained, water-stained, cinders. Lithos of rocks? Rocks! No. Olive greens. Smoky-blue greeny greys. From a distance the rivers look to be in flood, turbulent, runod brown and white. Then they look like rough, crooked gravel roads. They are neither: they are dry; dry riverbeds! A village of gravel pit campers. A burrough? After this round, no more photo litho—too facile for me. Wide, rough land, uneven land of sombre green, like the first skin of foliage over Africa, when the planet was at last cool enough for life; or the first life returning, or the last remaining after the environ- mental holocaust, after we have extinguished ourselves and our works and burned away the soil. Rocky Harbour: north of—grey, raining hard, impossible to see any- thing. A lot of trabc—fish trucks and tourists on the go. I decide to turn around, go back: there will be another day. Trout River Hike: torrential rain so we turn around halfway. Bump into Tom Conway and missus on the path! Water coming od the Tablelands as od the back of a surfacing whale. The rivulets disappear into the scree before getting to the bottom of the hills, sometimes reappearing a hundred yards or so above the road. This is true also of the larger brooks—cascading od the hills, joining in forks, disappearing into a still-dry riverbed (Dry Brook Canyon). That is why so much of this area is unstable, always in motion: it must rest on a bed of pug. It is in its way, and especially in its weathers, a fearsome place: How slight to paint it in diddling decorator’s colours and notations on the excuse of its albeit impressive sunsets, as if it were a bedspread or a negligee! A card table or a paint-by-numbers calendar. A decoration. That would be an act of desecration, an insanity. If you don’t know about Christopher Pratt, you should. His paintings of Atlantic Canadian settings are meticulously detailed and precise, and they don’t simply record the landscape, but act as emblems of Pratt’s experience of his homeland. Born in St. John’s Newfoundland in 1935, he studied art at the Glasgow School of Art and Mount Allison University in Sackville, New Brunswick, before deciding in 1963 to dedicate himself to his art full time in his home province of Newfoundland. 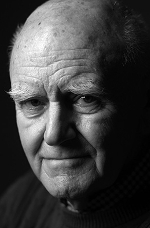 His works have been exhibited nationally and internationally, and have received many prestigious awards and honours. In 1980, he designed Newfoundland and Labrador’s provincial flag. He was named a Companion of the Order of Canada in 1983. Pratt lives and works in St. Mary’s Bay in Newfoundland. Can’t you just see the paintings forming before your eyes? I know I can! I hope you liked this little peek inside the mind of the inimitable Christopher Pratt, and I also hope to see you all at the launch on November 5. 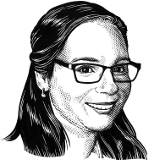 This entry was posted in Letters from the Porcupette (the Intern's Blog) and tagged Christopher Pratt, excerpt, Thoughts on Driving to Venus, Tom Smart. Bookmark the permalink.